Q1. How can I book a Bulky Waste Pick up? If you are a resident of the ACT and have an eligible Concession card you can call 6249 7974 to speak to someone helpful who will assist you to make a booking. Or you can complete the Contact Us form on the front page of this website. Q2. Do I have to book a service or can I just place out items for collection any time? Before placing any items out for collection you will need to contact the Bulky Waste Pick up service and book a service. Items placed out the front of your home will not be collected without a booking. If you are moving, plan for your collection to take place before you leave the property. Q3. What can I put out for collection? This is a Bulky Goods Service. Items to be collected must be bulky and be quick and easy to take away, they must be able to be safely lifted by two people; generally less than 2 metres in length and weigh no more than 46kg per item. We can pick up a maximum of 2 cubic metres of material and a maximum of 10 items within the 2 cubic metre limit. Q4. What can't I put out for collection? This service is not a rubbish removal service. We cannot take away garden waste, building rubble or general household rubbish. Please do not place out any items that cannot be reasonably removed by two people and / or items over two metres in length. •	Oversized items larger than 2 metres in length and 46kg in weight. •	General household rubbish. Please place in your rubbish bin or take to landfill (fees apply). •	Garden waste, prunings, clippings, etc - please place in your compost bin or utilise the services of a rubbish removal company. Garden waste can be delivered free of charge to the Mugga Lane Resource Management Centre. •	Compostable waste including foods scraps – please place in your compost bin or worm farm. •	Sheet glass or mirrors. Needs to be taken to landfill (fees apply). •	Hazardous chemicals including pesticides, paints, cleaning agents, solvents oil etc. Disposal information can be found at http://www.tams.act.gov.au/recycling-waste/recycling_ansd_waste_disposal/household_hazardous_waste. •	Fireworks and explosives. Please contact the Australian Federal Police regarding the appropriate disposal of these items. Q5. Why doesn't the ACT government accept all materials through this service? •	Safety considerations – items must be within specified weight and length requirements to ensure safe work practices for staff handling this material. These materials can also cause fire or explosions if not handled appropriately. •	Hazardous materials – it is important that poisons, chemicals and other hazardous materials are handled and stored in the proper manner to safe guard us and our environment. Q6. What are recyclable materials and what should I do with these items? Q7. Where do I place items for collection? Items will need to be placed out the front area of your property, somewhere that is easily accessible by our drivers. Please keep your items within your property boundary. If you live in a multi-unit development you must contact your body corporate or managing agent to identify a suitable location for placement of your goods. Please note our drivers are unable to enter into your home or garage to retrieve items. Q8. How much material can I place out? The maximum amount of bulky waste to be collected per dwelling is two cubic metres. Each item must weigh no more than 46kg and be no more than 2 metres in length. Q9. How do I present my items for collection? Please stack your items together in a neat and tidy manner in the front area of your property where they can be easily accessible by our drivers; for example, on your driveway, front lawn etc. Please ensure your items remain within the boundaries of your property and consult your body corporate about an appropriate place to leave your items if you live in a multi-unit dwelling. Make sure you do not place your items where they will interfere with the emptying of your garbage bins. Q10. When will my items be collected? To arrange a collection please call the Bulky Waste Collection Service on 6249 7974 to book a date. Place your items out either the night before or early in the morning of your allocated pick up day. Your items will be collected sometime between 8am and 2pm on that day. You must be present on the day to show your concession card to the driver and to sign the booking form. If the driver cannot sight your card, your pick up will not occur. Q11. What if I forget to place the items out in time for my booked collection? If you have booked a service and have not put out your items, the contractor will still claim the service as a provided service and this will result in your annual entitlement being used. Q12. Most of my items were collected but some were not. What do I need to do? 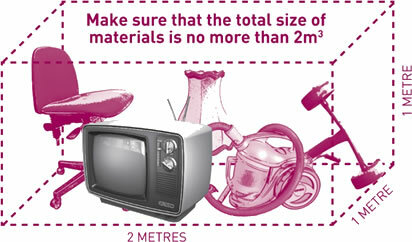 Some items are not suitable for collection in the bulky waste pick up. Please refer to Question 4 - What can I put out for collection?, Question 5 - What can't I put out for collection? and Question 9 - How much material can I place out? You will be required to remove unsuitable items from the front of your property after the collection has occurred. Q13. Where does the bulky waste material go? The items collected through the bulky waste pick up service will be taken to the Resource Management Centres at either Mugga Lane or Mitchell, where they are sorted into various waste types. Any items with a resale value are taken to the reuse shops, recyclable materials are recycled appropriately and residual items are taken to landfill. Q14. Will my items be recycled? The ACT is one of the leading jurisdictions in waste management in Australia, with over 70% of waste generated being reused or recycled. The Government remains committed to doing more and progressing towards its goal of zero recoverable waste sent to landfill. The Bulky Waste collection Service has procedures in place to ensure as much collected material as possible will be recycled. This is done by either dropping off at the re-use shops or at the appropriate recycling areas within the Resource Management Centres. Q15. I live in a unit complex or townhouse - will that affect me? There are no special requirements if you live in a multi-unit development unless there is a Body corporate in place. If so, you will need to consult them about the most appropriate place to place your items for collection. You might like to consult with other residents and book a pick up at the same time. Q16. I live in a battle axe block - will that affect me? There are no special requirements if you live in a battle axe block. You just need to place your items somewhere in your front yard where they are easily accessible by the driver. Please let us know when making your booking that you live in a battle axe block to assist the driver to find you. •	A Seniors My Way Card valid for residents over the age of 70 years. Q18. How can I make a complaint about the service? If you are unhappy with the service, in most cases it is likely the matter can be sorted out on the spot by speaking to us directly. Please call our office on 6249 7974 to speak to someone helpful. If you are still not happy you may email us with your specific concerns to bulkygoods@gmail.com.